“The Good Place” is not about philosophy in the way that “The Big Bang Theory” is about science — as a set of clichés to tap for silly jokes. A sitcom is not a grad school seminar, obviously, so the philosophy is highly abridged. But it is not insubstantial, and philosophical ideas actually determine and shape the plot. I had been tangentially aware of the show (from its availability on Netflix), but didn’t appreciate its premise or its grounding in actual philosophy — a very specific brand of philosophy, as it turns out. As embodied in a specific book. By — moment of sheer astonishment — one of my oldest friends. At the beginning of Episode 6, Chidi holds up a book: a thick academic paperback with one of those devastatingly quiet covers (earth tones, Morandi still-life) that make you feel as if you will never be allowed to leave the library again. Eleanor reads its title aloud — “What We Owe to Each Other” — and gasps. Pamela Hieronymi [a philosophy professor at UCLA, , brought onto the show’s staff as “consulting philosopher”, surely the first in sitcom history] introduced Schur to “What We Owe to Each Other”; Scanlon was her dissertation adviser at Harvard. It was the perfect way to deepen the show’s original premise — that mechanistic notion of an ethical points system. It was richer, Hieronymi argued, to think of morality in terms of cooperative human relationships — the way networks of people, with their interdependencies and conflicts, have to find a way to coexist and sacrifice and treat one another with respect. In such messy human environments, ethical choices rarely map directly onto obvious results. There are no leader boards. The problems can be almost infinitely complex. It is, in a way, deeply un-American — an affront to our central mythology of individual rights, self-interest and the sanctity of the free market. As an over-the-top avatar of all our worst impulses, Eleanor is severely allergic to any notion of community. And yet her salvation will turn out to depend on the people around her, all of whom will in turn depend on her. What makes us good, Chidi tells her, is “our bonds to other people and our innate desire to treat them with dignity.” As the show progresses, “What We Owe to Each Other” becomes a recurring character, popping up onscreen at several crucial plot points. This amazed Hieronymi — the last thing she had expected to see was her dissertation adviser’s book featured prominently on a network sitcom. Never imagined that I would figure in a sitcom. It makes me nervous, but so far nothing really bad has resulted, as far as I know. Me, I’m binge-watching the sitcom, with great pleasure. S1 E8 “Most Improved Player” is currently streaming past me. Now: a few notes on the show; on the book; on Morandi (the artist); and rather a lot about Tim, most of which he will find embarrassing. 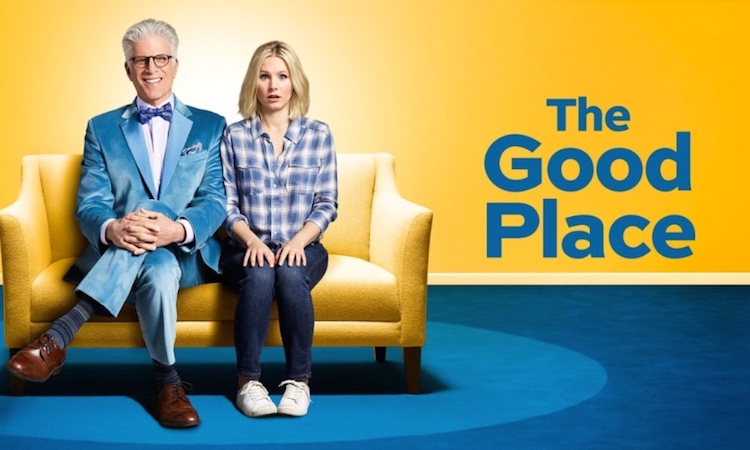 The Good Place received positive reviews upon its debut and has since gained critical acclaim. It has been praised for its acting, writing, originality, setting, and tone. In addition, its first-season twist ending and its exploration and creative use of ethics and philosophy have been positively received. 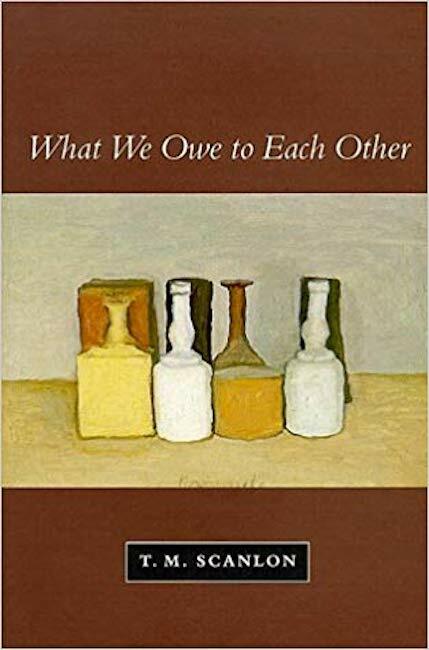 The Morandi on the cover of the book is his Still Life of 1956. In line with the theme of the book, it shows a small community of everyday objects — similar in many ways, but each distinct from the others. Against the usual custom in these things, which is for the publisher to pick the cover art, the Morandi was chosen by Tim and his wife, Lucy Welliver Scanlon (who is, among other things, a ceramic artist; see her excellent website). Thomas Michael “Tim” Scanlon (born 1940), usually cited as T. M. Scanlon, is an American philosopher. He was the Alford Professor of Natural Religion, Moral Philosophy, and Civil Polity in Harvard University’s Department of Philosophy until his retirement at the end of the 2015–2016 academic year. He was elected to the American Philosophical Society in 2018. Born June 28, 1940, Scanlon grew up in Indianapolis, Indiana; obtained his undergraduate degree from Princeton University in 1962 [in philosophy, as a student of Paul Benacerraf, who was also my adviser]; earned his PhD in philosophy from Harvard under Burton Dreben [at the time Tim and Lucy were in Cambridge for Tim’s graduate work, Ann Daingerfield Zwicky and I were there for my graduate work at MIT, so we got to spend pleasant time together]; studied for a year at Oxford University on a Fulbright Scholarship; and returned to Princeton University, where he taught from 1966 until 1984. He was made a MacArthur Fellow in 1993. His dissertation and some of his first papers were in mathematical logic [my own specialization in mathematics as an undergraduate, before I discovered linguistics and defected], where his main concern was in proof theory, but he turned to ethics and political philosophy, where he developed a version of contractualism in the line of John Rawls, Immanuel Kant, and Jean-Jacques Rousseau. Scanlon has also published important work on freedom of speech, equality, tolerance, foundations of contract law, human rights, conceptions of welfare, theories of justice, as well as on foundational questions in moral theory. His teaching in the department has included courses on theories of justice, equality, and recent ethical theory. His book, What We Owe to Each Other, was published by Harvard University Press in 1998; a collection of papers on political theory, The Difficulty of Tolerance, was published by Cambridge University Press in 2003. 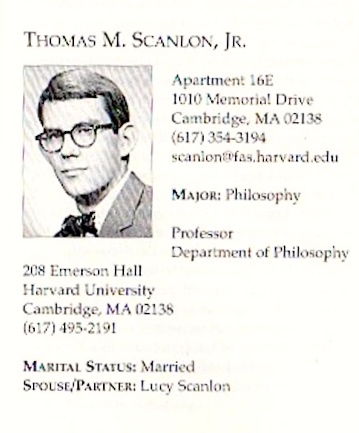 Scanlon is the father-in-law of philosopher and scholar of African-American studies Tommie Shelby [since 2013, the Caldwell Titcomb Professor of African and African American Studies and of Philosophy at Harvard; and married to free-lance journalist Jessie Scanlon]. Prodigiously smart, and also — this is the potentially embarrassing part — one of the world’s nicest people: humane, generous, engaged, empathetic, wryly funny, all that good stuff. But how can it be almost 60 years since those Campus Club days at Princeton? This entry was posted on October 11, 2018 at 8:05 pm and is filed under Art, Movies and tv, My life, Philosophy. You can follow any responses to this entry through the RSS 2.0 feed. You can leave a response, or trackback from your own site. What a nice post, Arnold! Tim will be embarrassed but surely also pleased. Thanks, Lucy. I have added a link to your excellent website.